Preheat the oven to 190C/gas 5. Butter a 21cm non-stick tarte tatin pan or non-stick solid-based cake tin. Over a low heat, warm the butter, oil, sugar and honey. Stir until the sugar dissolves, then boil for 3–4 minutes. Remove from the heat and cool for 10–15 minutes (until it’s not too hot to touch) and add the vanilla extract. In a deep bowl, mix the oats and muesli with a good pinch of salt. Create a well in the centre and pour in the wet ingredients and, using your hand, stir with a claw motion, this makes for a lighter flapjack. Don’t knead it. As soon as all the oats are golden and sticky, turn into the pan. Don’t give it more than the merest pat, or all your careful mixing work will be undone. 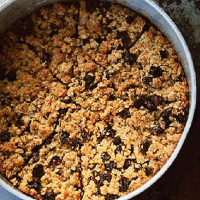 Bake for 15–20 if you like your flapjacks gooey; for a crisper brown, cook for 20–25 minutes. Cool in the tin for 10–15 minutes, then run a metal spatula around the inside edge of the tin. Cut the flapjack into slabs, remove from the tin and cool on a wire rack.